Exciting times are afoot at Chez Bishop: my gorgeous twin sister Jojo has come to stay for five days and Bert is SO excited to have his favourite Auntie here to visit. When he saw her arrive through the window this morning he did a little victory dance around the living room! Adorable. He also had to check with me that she was still here after his daytime nap today, frightened that the fun might be over and she might have left while he slept! Fear not Bert, she's here for a good while yet...! 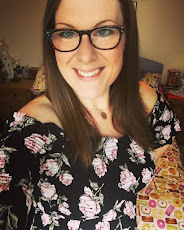 I'm working a lot at the moment building up my new freelance career in Social Media Consultancy: I'm really enjoying my return to the working world and I'm so lucky that the work I'm doing is varied, really fun, interesting and allows me to be creative! 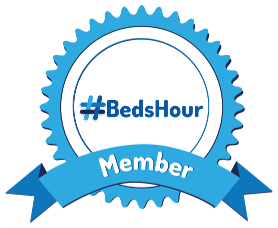 I'm working with some incredible small businesses and associates and feeling lucky to have found a career path that fits around being at home with Bert. I'm actually really enjoying the business meetings that I do have to attend (it has nothing to do with the fact that they usually involve tea & cake, honest!) It is nice to be out in the adult world beyond Peppa Pig and Bing Bunny, I'm pretty sure my brain had begun to turn to a mushy paste of CBeebies and silly talking, so it feels great to be jumping into creative projects that are challenging me and fulfilling my needs to be 'Lucy' as well as 'Mum'. This afternoon I had a work meeting to attend for a few hours, luckily Auntie Jojo was on hand to keep The Bertster entertained, and keep him entertained she did! I'd perhaps stupidly assumed that at 23 months Bert was too young to be initiated into the world of baking...but oh how wrong I was. 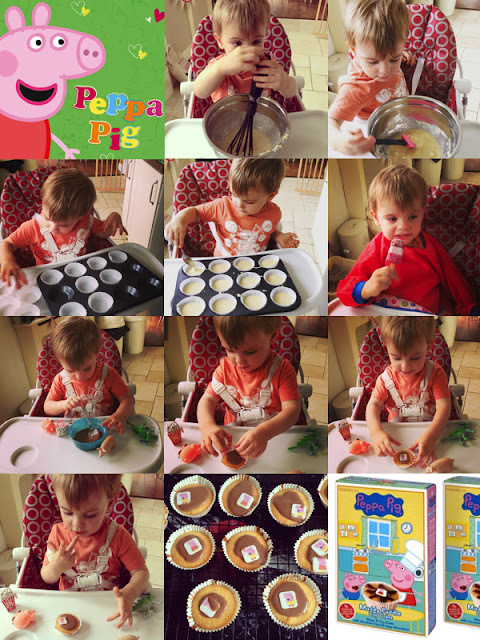 Auntie Jojo had arrived with a bag of goodies for Bert, one being a boxed cup cake mix from Symington's with a Peppa Pig theme of Muddy Puddles - and so while Mummy was at her meeting they set to work creating their cakey masterpieces! These box mixes are a great way to introduce little ones to baking - all you have to add to this mixture is an egg and some water, and everything else is weighed measured and comes in the box! Fuss free baking so you can concentrate on enjoying the moment instead of stressing about weights of ingredients and the mess of your kitchen - perfect. Whisking & mixing the cake mixture, popping the paper cases in the tray & spooning in the cup cake mixture - Bert managed every stage of the baking process once Jojo showed him what he needed to do. Clever lad! 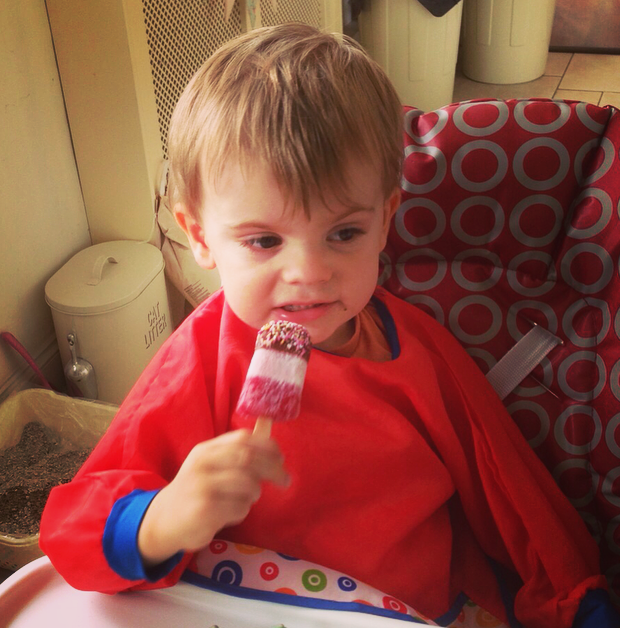 Of course, everyone knows that the patience of a 23 month old toddler isn't brilliant, so having to wait 10+ minutes for the cakes to bake could have proven challenging but not for the Bertster, he opted for an ice lolly filled interval - clever kid! Mixing the "mud" icing, spooning it onto the cakes, placing on the Peppa Pig rice paper decorations, and the customary licking of fingers... and finally, the finished and rather impressive cup cakes! As a keen baker, it absolutely melted my heart to see these photos and hear about what a good boy he'd been and how much fun he'd had! It's gotten me really excited at the prospect of being able to bake with my boy, and watch him also get pleasure from creating in the kitchen. Bert is working really hard on pronouncing Peppa Pig - his putting two words together is really coming on & he amazes us every day with what he is capable of and how fast he is learning! He ate a cake as soon as they were finished, and seemed rather pleased with himself too (too right!). He 'might' have been allowed a cheeky second cake after his dinner tonight, mainly because I was so blooming proud of him! 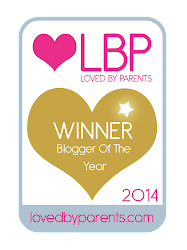 We are heading to a big picnic tomorrow with some of my wonderful blogging friends and their children. Bert will be proudly bringing along the fruits of his first ever baking session and will share his Peppa Pig cup cakes with his little friends...adorable. 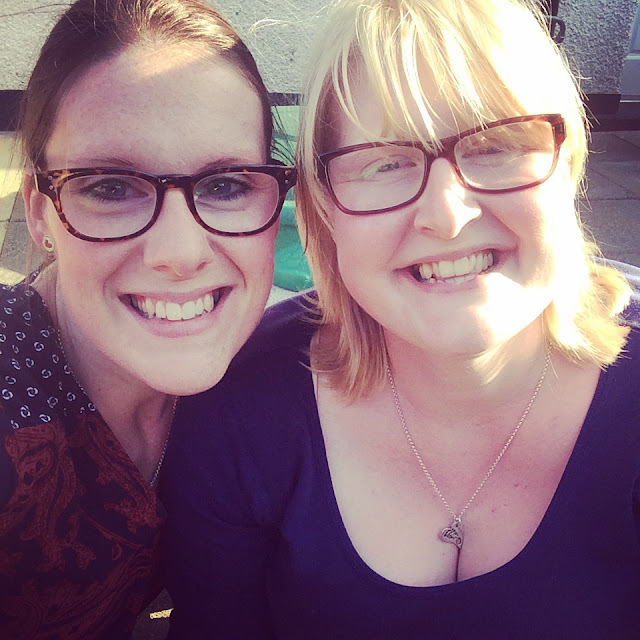 It has been a wonderful day: a lovely lunch and catch up with my sister, playing in the garden with Bert, a very positive/fun work meeting, followed by a proud parent moment when I heard all about Bert and Jojo's baking fun. Top that off with a yummy dinner, pudding and episode two of The Great British Bake Off and I'd say it's been a pretty marvellous day all round. Woop! Woop! 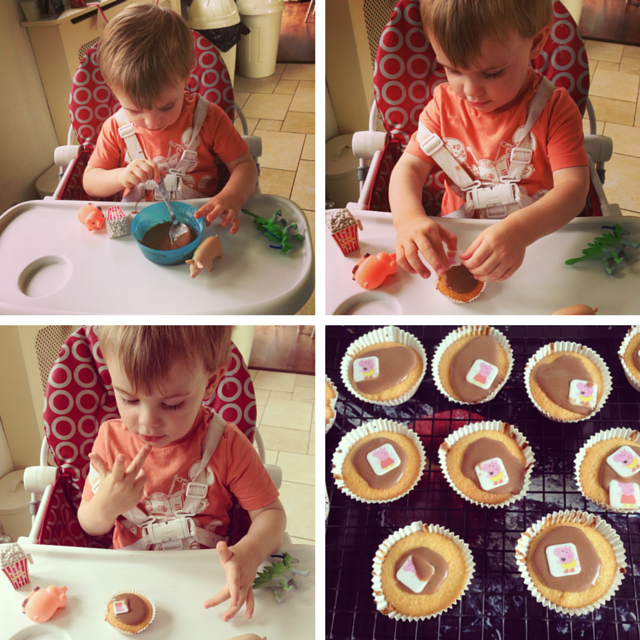 May this be the start of Bert's love affair with baking, just like his Mumma! It's a Twin Thing. Me and my lovely twin sister Jojo earlier today enjoying the sunshine in the garden while Bert played. 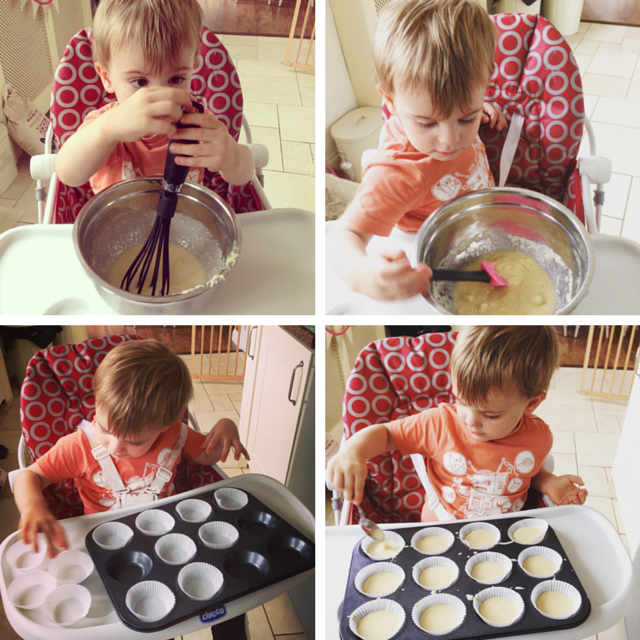 When did you start baking with your little ones? Disclaimer: This post is not sponsored in any way. I love these cake mix boxes for baking with mini people & just wanted to share a wonderful moment with my lovely readers.